Mixed Media, Abstract, 10″ x 10″ x ~1″. By Debbie McCarthy. $100. Love it? Click here to purchase. In this video, we discuss the one thing for which artists are responsible. We can’t choose how society views artists but, as artists, we can choose how we view ourselves. Side Arts founder, Todd, welcomes you to Side Arts and describes one important rule. We focused on improving the performance of the site. Some users had noted that the page loading speed had decreased, so we updated and optimized the code. We’re testing some new code for the listing submission forms. Some users noted that the form cut off before the bottom, this has been fixed. All forms are secure and we have added our provider’s seal of approval. The search category for active versus expired has been moved to the next to the top of the search categories since it is the most used category after location. Updating the email delivery features for basic members. Text alerts for professional users. We do our best to test all updates prior to going live, but sometimes bugs slip past us. If you see any errors or have any suggestions, report them to mail@sidearts.com (or use the new customer service widget). We surveyed over 1000 basic, premium, and non-member artists. The results will surprise you! On average, Side Arts Premium members earn 20% more art income annually by using the Premium search and save features, proving that Side Arts pays for itself and then some. 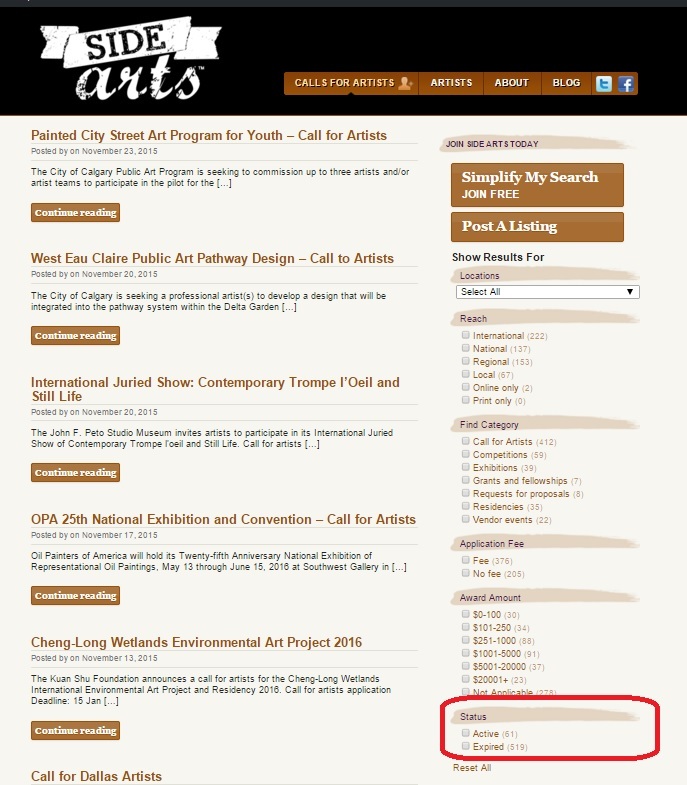 Our unique, advanced search and alert features stands out when compared to Basic members who earn just 3% more art income annually searching Side Arts manually. Members say they are more than likely to recommend Side Arts to a friend. Great question from a member, Tara Holl, this week: How do I screen out expired or active listings? Side Arts only posts new, active listings from our clients – no duplicates and no passed listings. Use the Active category to see only current listings. Use the Expired category to see only listings which have passed their deadline. This is a great way to research clients that have offered listings in the past. 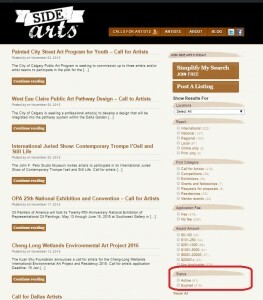 Use the other categories to refine your search by location, type of call, award amount, and so on. All members can search and premium members can save their search preferences. This weeks’s updates includes separating out the residencies into their own category. As a reminder, anyone that offers recommendations for bug fixes or new features that are implemented will receive free listings or a few months of professional membership. Send your ideas to mail@sidearts.com. Social sign-in. Use your social networks (Facebook, Instagram, LinkedIn, and Twitter) to sign in to SideArts. That’s one less password to remember! Upgraded social sharing feature. It is easier to share your favorite listings on Facebook and Twitter. Fix: Password recover feature. This was a bit buggy, but we have it straightened out. Some members have reported difficulty with the password reset/retrieval feature. If you are unable to recover your password, please email mail@sidearts.com. We will reset and resend your password for you. Our tech heads are working on the issue and should have it resolved soon. -Todd and the Side Arts team. Update 5 Nov 2015: Password reset has been fixed. Improved customer service support – use the question mark in the lower right to send questions and make suggestions. Updated and clearer member sign-up page.